Beautiful engraved RARE specimen certificate from the Alta Vista . This historic document was printed by United States Banknote Company and has an ornate border around it with a vignette of the company name and this item has the printed signatures of the Company's President and Secretary. The name AltaVista refers both to an Internet search engine company and to that company's search engine product. AltaVista logo in days of biggest success.AltaVista was started by Digital Equipment Corporation employee volunteers who were trying to provide services to make finding files on the public network easier. AltaVista was launched public as a internet search engine on 15 December, 1995 at http://www.altavista.digital.com. AltaVista was misunderstood by its parent company. Digital Equipment Corporation, a hardware company, missed the potential of the Internet and instead rationalized that AltaVista would be a showcase for its new line of servers. At launch the service had two innovations that set it ahead of the other search engines. It used a fast multi-threaded crawler (Scooter) that could cover a lot more Web pages than were believed to exist, and an efficient search back-end running on advanced hardware; as of 1998, 20 multi-processor machines with 130GB RAM and 500GB hard disk space each, receiving 13 million queries per day. These made AltaVista the first searchable, full-text database of a large part of the World Wide Web. In 1996, AltaVista became the exclusive provider of search results for Yahoo!. In 1998, Digital was sold to Compaq, and in 1999 Compaq relaunched AltaVista as a web portal, abandoning their streamlined searchpage and alienating their core userbase. In June of the same year, Compaq paid AltaVista Technology Incorporated ("ATI") US$ 3.3 million for the domain name altavista.com (Jack Marshall, cofounder of ATI, had registered the name in 1994,) but it continued to lose marketshare, especially to Google. It was subsequently floated from Compaq as an independent company. 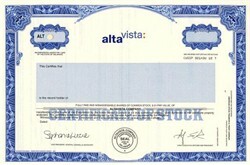 In February 2003, AltaVista was bought by Overture Services, Inc. The failed attempt at a "portal" was dropped and the website was again revamped to provide simple search functions. In March 2004, Overture itself was taken over by Yahoo!. In Aug. 2004, shortly after Yahoo! 's acquisition, the AltaVista site started using the Yahoo! Search database. AltaVista was also one of the numerous websites which promised "free email for life", only to subsequently reverse this policy by charging a subscription fee for its email services. In 2001 it announced it would launch an ISP in the UK with no phone call charges and only a �10 a year subscription fee. However the service never launched. AltaVista provides free translation, branded Babel Fish, which translates text between several world languages.